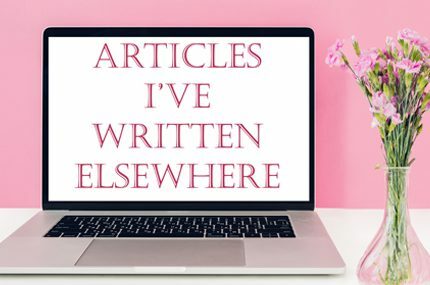 Disclosure: this blog post is sponsored by David Nieper. Office dress codes vary from the super-conservative to ‘anything goes’, but generally speaking smart or smart-casual is the norm. Even in workplaces where the rules are pretty relaxed, you may be expected to dress ‘professional’ for client meetings and the like. From trousers suits to wraparound dresses, whatever office wear you’re shopping for, don’t forget to consider your office lingerie wardrobe too. Choosing underthings that work with your clothing means you can keep comfortable, look professional, and focus on the task at hand instead of worrying about something like a visible knicker-line! ­­Ultra-sheer tights can be worn even in the summer, and in winter opaque black tights are a smart option that’ll keep you warm in skirts and dresses if you’re not a fan of trousers. Camisoles, or camis, are wonderfully versatile garments that cross the line between underwear and outerwear. A camisole can add an extra layer under tops and shirts for warmth, or you can pair one with a higher neckline with a V-neck for added modesty in the office. In fact, sometimes you can even forgo the shirt/top – a pretty cami looks great peeking out from under a tailored suit jacket! An alternative to the camisole is the body or bodysuit, which has the practical advantage of staying tucked into your skirt or trousers for a completely seamless line. For this reason, they’re also ideal under form-fitting, tailored or jersey dresses. Some bodysuits are made from strong ‘control’ fabric, making them a great choice if you want a little tummy control under your outfit. If you tend to wear white blouses or shirts to work, then this bra will be your new best friend! A white bra can be surprisingly visible underneath a white top, so choose a bra that blends in with your own skin tone instead. Bonus points if it’s a t-shirt bra with moulded, seam-free cups as it will provide a smooth line underneath lightweight or stretchy fabrics. Have you ever almost left the house in something, only to realise it was completely sheer when the light hit it? I have, and I’m just glad I noticed in my hallway and not when I arrived at work! That’s why I’ve fallen in love with slip dresses – they provide that extra layer of opaque lining that’s missing in so much modern clothing. Slips also add an extra layer of warmth in the winter, and dresses in certain fabrics seem to move more nicely on the body when there’s a slip underneath. Half slips, or slip skirts as I call them, are another option. Do you have skirts or dresses that keep getting wedged between your legs when you walk? A slip will fix that! 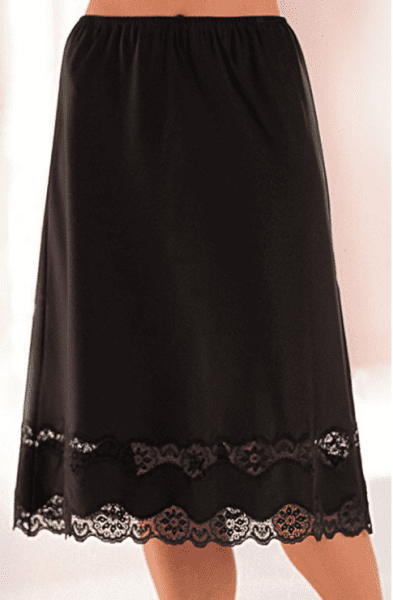 Many slips have decorative lace trims, which means they double up as skirt extenders. Have a skirt that’s a tad too short for your workplace? Wear a beautifully-trimmed slip underneath which is a few inches longer than your skirt. Most people won’t even realise the trim isn’t part of the skirt itself! Longline, stretchy knickers like those below have a couple of great benefits for the workplace. For one thing, their shape eliminates visible knicker-lines, making them a great choice under jersey skirts and dresses. They also help to prevent thigh-chafing and keep you cool and comfortable on hot days, so if that’s a problem you experience and your office hasn’t quite figured out air-conditioning yet, add these to your shopping list! I hope you’ve found this list useful! Do you have any other workwear-themed lingerie tips to share, or pieces that work well for you?